The Second Ticket Lottery schedule as well as the opening day for general tickets sales have been released!! Information on the Second Ticket Lottery & General Ticket Sales has been released! Premium Tickets are still available through the Second Ticket Lottery. However, after the second official ticket lottery is over, there won't be any more chances to get one. If you want to get the Premium Ticket benefits be sure to enter the Second Ticket Lottery! Only Regular Tickets will be available on a first-come-first-served basis during the General Ticket Sales period. The livepocket link for the international lottery ticket sales webpage is still unavailable. It will be released soon! Thank you for your patience! ＊All times are in Japan Standard Time (JST). For ticket details please visit the INFORMATION page. Important points to note regarding the tour can be found at the FAQ page. 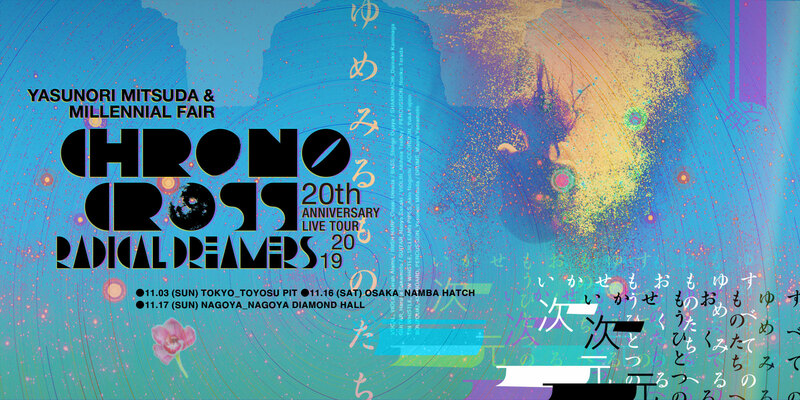 The CHRONO CROSS 20th Anniversary Tour 2019 RADICAL DREAMERS Yasunori Mitsuda & Millennial Fair Logo, Main Visual and Promotional Video have been released!! The CHRONO CROSS 20th Anniversary Tour 2019 RADICAL DREAMERS Yasunori Mitsuda & Millennial Fair live concert logo has been completed! The designer, Keiichi Yamashita, is the same who designed the Chrono Cross Original Soundtrack. The design is filled with various motifs and themes from Chrono Cross, from another dimension to multiple worlds, two moons and so on. The main visual has also been released! The graphic's theme is "Entering a Dream". Of course, we will all be inside the dream once the live concerts start. The beautiful design is leading all of us dreamers into the world of dreams. The live concert promotional video has also been released! Check it out at our YouTube channel! The First Ticket Lottery starts today!! Starting from today, you'll be able to enter the ticket lottery. Be sure to enter before the end of the Entry Period! ＊ You can change the language to English in the bottom right corner! If you have questions regarding the live tour please look at our FAQ page! Daisuke Kaminaga (WagakkiBand) has joined! With him, all the band members have been announced! Now that Daisuke Kaminaga has joined, all of the members of Yasunori Mitsuda & Millennial Fair have been announced! The star-studded band is complete and the stage is set. Yasunori Mitsuda chose these band members to best capture the musical world of Chrono Cross. All of the arrangements will be made by Yasunori Mitsuda, so this will be an event you don't want to miss! The ticket lottery opens tomorrow! Information about the First Ticket Lottery has been released!! Thank you very much for you patience. The details are finally available! The English translation of the FAQ page will be updated as soon as it is available. Also, the ticket details were also released! The first group of Yasunori Mitsuda & Millennial Fair band members has been revealed!! Yasunori Mitsuda & Millennial Fair's charming and charismatic members have finally been announced. You can see the members' pictures and profiles on the musicians page! Also, we received comments from some of the musicians! Check them out on the comments page! With all these fantastic musicians, the Concert Tour will undoubtedly be amazing! You can expect fun, exciting and emotional performances that will warm your heart and bring tears to your eyes. The CHRONO CROSS 20th Anniversary Live Tour 2019 RADICAL DREAMERS Yasunori Mitsuda & Millennial Fair has been announced!! Tagline: For all the Dreamers, the dream is not over yet.